Yesterday afternoon, a mailman appeared bringing us a large cardboard envelope with another Standa Hajek’s masterpiece boxart. 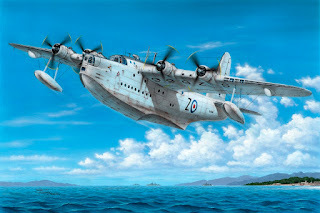 The picture will adorn our 1/72 Sunderland Mk.V kit (SH72162) and shows SZ566/Z machine flown by Vaclav Bergman in Singapore area during the Korea war when the Brits were also engaged in Malaya fighting communist insurgent forces. Vaclav Bergman, a Czech with DFC&Bar, fled his homeland Czechoslovakia twice, first time after the Nazis had stormed and occupied Czechoslovakia, and after the war because of the communist takeover. During the Second World War, he fought with the RAF flying fighter aircraft. He was one of the Czechs who took part in the Battle of Britain and in 1944 became the CO of No 313 Sqn RAF.